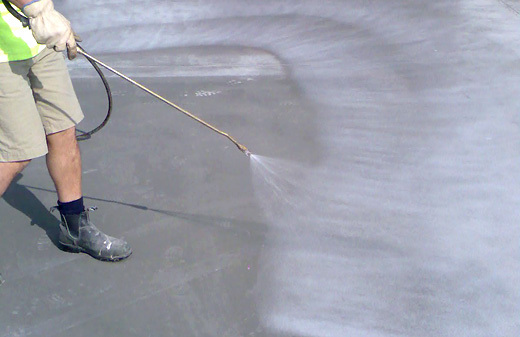 When most people think of curing, they think only of maintaining moisture on the surface of the concrete. But curing is more than that—it is giving the concrete what it needs to gain strength properly. The other important aspect of curing is temperature—the concrete can’t be too cold or too hot. As fresh concrete gets cooler, the hydration reaction slows down. The temperature of the concrete is what’s important here, not necessarily the air temperature. Below about 50 F, hydration slows down a lot; below about 40 F, it virtually stops. Hot concrete has the opposite problem: the reaction goes too fast, and since the reaction is exothermic (produces heat), it can quickly cause temperature differentials within the concrete that can lead to cracking. And cement that reacts too quickly doesn’t have time for the crystals to grow properly so it doesn’t develop as much strength as it should.